This week’s post is inspired by my friend’s loving relationship with her boyfriend. She wants to stay anonymous, so let’s call her “Justine” and her man, “Justin”. Haha. Justine and Justin always seem so happy together. They never appear to have any arguments, and it seems like they’re still in their honeymoon stage after 6 years of dating. It’s as if their relationship is perfect. I started to observe them. I wanted to know what it is that makes their relationship so successful. A lot of my friends have complained to me stating that I nag them too much. I agree. I honestly do not intend to nag you guys so often. I will work on it. This is a topic that has been on my mind for quite some time. 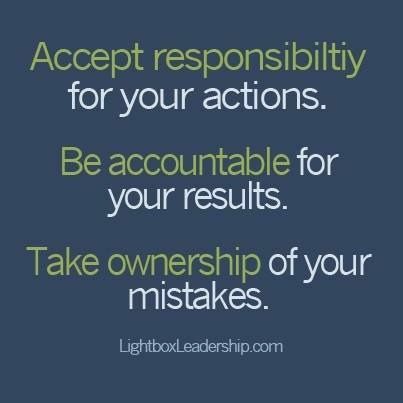 In life, we have a tendency to blame others for our problems or failures. When something doesn’t go the way we want it to, it’s usually, “Oh, it’s because of ________.” Or it’s because ________ happened”. That is because, we don’t like thinking it’s our fault. We blame everyone but ourselves. For example, if you had a bad professor and you did poorly in the class, you might say, “It’s because of the prof! He/she can’t teach! It’s so unfair. He/she is totally biased.” And so on. However, stop for a minute and ask yourself. Did you attend every class? If you did, were you paying attention? Did you procrastinate on your assignment? There are many factors that could affect your grade. Yes, perhaps the professor was bad, but you were the one who made the choice to attend class or not; to pay attention or not; to procrastinate or not. Remember, bad things happen to everyone, but you do not have to react a certain way. If you blame everyone else for your problems, you are literally saying you have no control over your life. Don’t allow others to dictate your life. Be the driver of your emotions. In addition, if people can sense how you will react, they can easily choose to manipulate you. Think about it. Those who are successful are not easily fazed. P.S. I have another award nomination post that I will be posting this coming week! (Basically, I have to answer some questions about myself, haha) So if you want to find out more about me, stay tuned! I was nominated 2 weeks ago but I had to complete the quote challenge first. Check out my quote challenge, guys! This is my last post for the quote challenge. 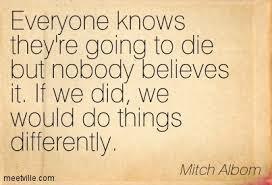 This quote is from “Tuesdays with Morrie”, one of my favourite books. I really like this quote because it’s so true. We all know we’re going to die one day, but in our minds, that’s not going to happen for another 50-70 years (depending how long you think you’re going to live). As a result, most people continue living the same way that they’ve always lived.